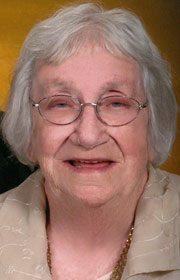 Betty L. Olmstead, 81, of Fort Dodge passed away Wed­nesday, July 19, 2017 at the Fort Dodge Villa Care Center. Funeral services will be 1:30 p.m. Saturday, July 22, 2017 at First United Methodist Church. Burial will be at the Otho Cemetery. A visitation will be Friday 4:00 to 7:00 p.m. at Laufersweiler-Sievers Funeral Home. Betty is survived by her husband, John Olmstead and little dog Bella of Fort Dodge; son, Johnny Olmstead and daughter, Danita “Dee” Burbank (Mark Alcorn) of Fort Dodge; grandchildren, Jeff and Teresa Burbank; Lora and Chris Novencido; Noelle Olmstead; great grandchildren, Ryan, Conner and Katie Burbank; Fisher, Josie, Sydney, Miura Novencido; brother-in-law, Ed (Linda) Olmstead of South Bend, IN. She was preceded in death by her parents, Charles and Bessie (Irvine) Hayes; brother, Charles Jr.; sisters, Frances and Charlotte Hayes. Betty Lee Hayes was born January 12, 1936 in Sparrow’s Point, Maryland. She attended school and graduated from Sparrow’s Point High School in 1952. Betty went on to nursing school. She attended Church Home and Hospital and John Hopkins in Baltimore, MD. In 1953, Betty met John at a dance while he was serving in the United States Army stationed in Aberdeen, MD. The couple was united in marriage on May 20, 1956 in Elkton, MD. The couple moved and established their home in Fort Dodge. She was employed at Mercy Hospital until it closed in 1974. Most remember Betty from craft shows and flea markets, where she and John made many friends. Betty also enjoyed camping. She will be greatly missed by all who knew her.